Asheville wedding receptions and ceremonies hosted at The Horse Shoe Farm are unlike any you’ve attended before. 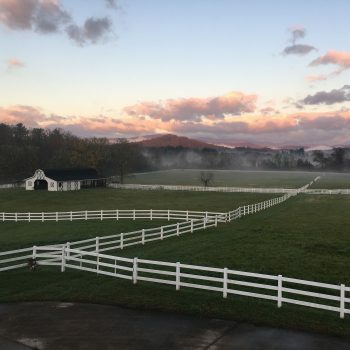 Stunning views of the nearby Blue Ridge Mountains surround over 80 acres of our beautiful pastureland. Our lush green foliage provides a sharp contrast to the pristine white fencing that cuts through the property. And stunning sunsets bathe the pastures in incredible hues of purples, oranges and pinks, also adding to the romantic atmosphere perfect for outdoor ceremonies. Exchanging vows on our beautiful estate is a wedding dream come true. The Horse Shoe Farm can accommodate all sizes of Asheville wedding receptions. Whether you’re wanting intimate ceremonies or big, bustling parties, we can handle it all. Our climate-controlled indoor event venues are ideal for Asheville wedding receptions all year long. You can either beat the heat in the summer or keep warm in the winter by hosting your party in our Sunset Barn or Big Sky Barn. Both venues have around 6,000 square feet of space that is waiting to be transformed. Open the large retractable doors to flood the space with light and incredible views of the Mount Pigsah vista. Or close the doors to keep things comfortable and cozy. For catering services, check out The Silo Cookhouse. Although it’s known for its elaborate menu and commercial kitchen, The Silo Cookhouse is the perfect place to wine and dine on the indoor and outdoor dining areas. The Silo Cookhouse also includes a comfortable lounge, where people can relax and mingle with one another. Out-of-town guests are fully accommodated at Asheville wedding receptions hosted at The Horse Shoe Farm. With a variety of luxury vacation homes to choose from, your guests can stay just steps away from the festivities. Stay overnight at The Magnolia Manor, The Stable House or The Willow House, which can each accommodate up to ten guests. However, we also offer cozy cottages for smaller groups and couples looking to extend their stay into a weekend getaway. View our online wedding brochure for more information on our available packages for Asheville wedding receptions and ceremonies. For a wedding day to remember, book with The Horse Shoe Farm.